As USAF’s first jet-powered refueling tanker, the initial task of the KC-135 Stratotanker was to refuel strategic bombers. But during the Vietnam War and other conflicts, this aircraft was extensively used to extend the endurance and range of the bombers and tactical fighters of the United States. What made the Stratotanker renowned was its being the only jet plane specifically designed for aerial refueling. It entered USAF service in 1957 and for 15 years, it was the only tanker employed by the Strategic Air Command. In the late 1960s, Stratotanker KC 135 proved its ability as a force multiplier in the Southeast Asia theatre. It was also assigned to the Air Education and Training Command, USAF in Europe, as well as to the Pacific Air Forces. The KC-135 also prided itself in being one of the six military fixed-wing aircrafts to render 50 years of continuous service to its original operator. Most Stratotankers will still be airworthy until 2040, and what better way to celebrate its long-enduring service but with this scale model airplane. A museum-quality display piece, this wooden replica makes for an interesting focal point anywhere you place it. 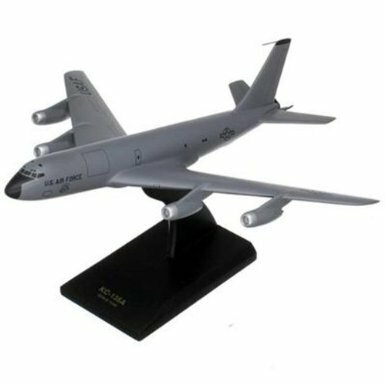 This model is hand-carved and hand-painted by our skilled model makers for a faithful scale representation of the KC-135 aircraft. Get this model plane today!